Since the old [Judeo-Christian] ethic [of the sanctity of life] has not yet been fully displaced [by the new ethic which places relative rather than absolute value on human lives] it has been necessary to separate the idea of abortion from the idea of killing, which continues to be socially abhorrent. The result has been a curious avoidance of the scientific fact, which everyone really knows, that human life begins at conception and is continuous whether intra- or extra-uterine until death. With the above quote in mind, what kind of people do you think are in charge of this nation, who unashamedly approve of the homicide of millions of kids? Better question: what kind of people are we all, that we not only allow this to continue, but actually approve of it by our votes in the ballot box and in our silence? Everyone knows it. Barack Obama knows it. (Do be sure to see page 2 of the AS article). Just like the California Medicine article above noted. We all know what is happening in the abortion mills around our nation. We know what kind of people we are, and we are experts in covering it up with medicine, entertainment, and self-help jargon. 22 Do you not fear Me?’ says Yahweh. Who gives rain, both the former and the latter, in its season. 29 Shall I not punish them for these things?’ says Yahweh. “A New Ethic for Medicine and Society,” California Medicine, Sept. 1970, 113(3):67-68. Originally posted 4/5/12, this was a part of a debate I had with a Roman Catholic. The original question was “Do Roman Catholics Have the Gospel?” Please read and share – I put a lot of work into this post. The reason I deal a lot with Roman Catholicism is because we interpret the cosmos in much the same way they do – One God who is Trinity, Scripture is His Word, and His Church is the means of communing with Him on earth, etc. Yet it is in the additions to the Gospel of Jesus Christ that they have departed from a true interpretation of spiritual, human reality. They lead many to damnation, tip-toeing inches from eternal life. Over the course of my nine year life in Christ, my heart has become heavy for the Catholics. Each day recently I have been pondering these issues, thinking hard about both sides, and trying to pray for wisdom. To most of you dear readers, this is perhaps an intellectual, interesting, or maybe slightly dry discussion which is all probably right up your alley if you’ve read this far. Yet I hope it is a little more than that to you – it is to me. These Catholic folks with their internet nicknames who have taken the time to talk with me… they are made in the image of God – and they are deceived by an antichrist spirit. I know that sounds harsh to our postmodern ears, but to be true to Jesus Christ I must be direct. Letting Smoke Out (my debate opponent) in particular has referred to me as a Christian who is “outside of the Church.” I appreciate his recognition of the Holy Spirit in me, but with all due respect, the Bible knows nothing of a Christian who is outside of the Church. I believe if we dig at this a little bit, maybe – by God’s wonderful grace – He may use it to unravel a little of the string holding together their bonds in darkness. I know, heavy sounding words… but this is life and death! Read Matt 18:17 again. See how Jesus instructs the apostles to tell the “church”. Clearly He is not referring to some theoretical entity, but to an established organization – His church. Our Lord gave definitive instruction at this passage and yet you believe He was referring to an “invisible body”. How can someone tell or listen to an invisible body? “Tell the church”…”listen even to the church”… now that’s clear. When I say that the Body of Christ is “invisible,” I mean that no one but God knows exactly all who is the wheat, and who are the tares. Remember how Jesus warned (Matthew 13:24-30, and basically the entire New Testament carries the same warnings) of unbelievers (hypocrites) who come into the fellowship with us, who pretend to be real Christians, but are not? We don’t really know who many of those “fakers” are… because they can look very convincing. That’s why the true Church of Jesus Christ is “invisible.” Those who have received the grace of adoption into the family of God are only known in our full number by God. This leads us to our point, namely that the Church of Jesus Christ is not a building, not an organization, but it is the Body of Christ made up of individuals. Would any Roman Catholic really say that every single individual who claims to be a Catholic is really, truly “in the Church”? Don’t Run Away! It’s Just an Eeeeeensy bit o’ Greek! (from ἔκκλητος called out or forth, and this from ἐκκαλέω); properly, a gathering of citizens called out from their homes into some public place; an assembly; so used. ek, “out from and to” and 2564/kaléō, “to call”) – properly, people called out from the world and to God, the outcome being the Church (the mystical body of Christ) – i.e. the universal (total) body of believers whom God calls out from the world and into His eternal kingdom. [The English word “church” comes from the Greek word kyriakos, “belonging to the Lord” (kyrios). 1577/ekklēsía (“church”) is the root of the terms “ecclesiology” and “ecclesiastical.”] (All emphases mine). In light of the definition of “church,” and not to mention the word comes from the same Greek word used for “elect,” should we not see the Church as the whole Body of believers, and not an organization or institution in Rome? How could LSO think of me as a sincere Christian who is simply “outside of the Church”? Being a Christian means I have been “called out” of the world and into the assembly of God’s people – it does not mean I am a Roman Catholic, Baptist, Amish farmer, or any other denomination. See the confusion of categories? Let’s be honest. Rome believes that she is the one true Church of Jesus Christ as an institution – not defined by faith in Jesus Christ and repentance of sins, but only defined by belonging to its number – to be saved you have to be in the Roman organization, and then cooperate fiercely with the prescribed ladder of sacramental righteousness to “make it.” And all of this off of an obscure verse about building the church on “this rock” – which may mean Peter, or his confession of faith, or Jesus may be talking about Himself… but even if He meant Peter, this still does not demonstrate a papacy! Most importantly though, the gospel of Christ is not found in Rome’s teachings. In some ways, it is very close – an almost gospel, yet the Apostles fiercely condemned counterfeit gospels which had merely added little bits and pieces to the gospel of Christ – while Rome has added dozens of things to it. Catholicism is a religion of lies, and it is taking its people to hell by the billions. That’s not funny – and believing Christians need to stop toying around with Rome. We are to stand up and call our Roman Catholic friends to repentance of dead works into a living, secure relationship with Christ based solely on His works and one time atonement. Here’s the hard, cold truth: I, Justin, and numerous others like me are not Roman Catholics, and yet we are the Body of Christ. I do not believe and in fact vehemently reject Romanist theology – I am walking in the footsteps of the millions who have gone before me, and in the footsteps of the Reformation Christians who shed their blood to salvage the gospel out from Rome. I have these convictions because of the gospel, because of God’s Word, and because He has chosen me unto an everlasting salvation, accomplished by Christ outside of and before me. I do not merit the grace He gives, otherwise it would no longer be grace but a debt He would owe. God will be no man’s debtor, believe that. So that is all to say to LSO and my other Roman Catholic readers; you may feel yourself generous and magnanimous for granting to me that I am a Christian, just simply outside of the Church, but your own papal doctrines really don’t allow for such. Either I, as a gospel believing Christian, am wrong and outside of His Body, or you are, or we are both in mythology. It cannot be that our mutually exclusive truth claims are the same gospel or ecclesiology! Finally, and most importantly, what does God’s Word say? What does it take to become a part of the Church of Jesus Christ invisible and universal? John 1:12 But as many as received Him, to them He gave the right to become children of God, even to those who believe in His name, 13 who were [i]born, not of [j]blood nor of the will of the flesh nor of the will of man, but of God. 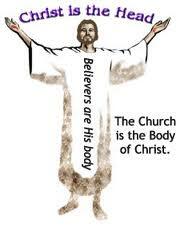 What does becoming a member of the Church/the Body of Christ result in? Justification, sanctification, and glorification. Good works which justify the reality of faith. WE WERE CONSIDERED AS SHEEP TO BE SLAUGHTERED.”37 But in all these things we overwhelmingly conquer through Him who loved us. 38 For I am convinced that neither death, nor life, nor angels, nor principalities, nor things present, nor things to come, nor powers, 39 nor height, nor depth, nor any other created thing, will be able to separate us from the love of God, which is in Christ Jesus our Lord. Galatians 5:6 For in Christ Jesus neither circumcision nor uncircumcision means anything, but faith working through love. (real faith which saves will always produce good works as a fruit). Thanks for reading an extremely long, but heartfelt post. P.S. I am aware that the Reformation was only 500 years ago and that Roman Catholicism has been in its present form for over 1,600 – but when I say “Reformation” in reference to the true Church, it is a synecdoche for Apostolic, original Christianity. P.P.S. I know that this in not the world’s greatest apologetic attempt, and that many of you could do better, but in all sincerity it is dedicated to the beautiful lover of my soul, Christ Jesus. May He do with it as He wills. You can find infinite commentary on what happened in Boston today. Many people were seriously injured, and at least a few died, including an 8 year-old. Our nation suffers yet another traumatic, surprise massacre. This has become the natural order of the day we live in. A few thoughts from the Christian worldview. Jesus is Lord. There is no good or evil in this world except by His working the good, or allowing the evil. He is Lord, and we must trust Him in all things. Reports have come in that in Iraq today, there were a series of bomb blasts that killed scores of people, and injured dozens more. Today Boston, USA is sharing in the bloodbath of what is everyday life in our war zones overseas. Although our tragedy is more unexpected, it has the same root cause: the sin of lust manifest in war. War is upon us. We are a people of war. We like war. We love war. It is intertwined in the fabric of our nation, and with each senseless tragedy, we drink down the wine of endless war’s fruit. This is the world we have chosen as a culture. Whoever did this deserves to face justice, and be sentenced to a just punishment fitting the crime. Acts of murder must be met with severe justice, in honor of the image of God we are all created in – life must be protected and cherished. Planned Parenthood is the slow-motion, blood-bath bombing that has been going off in our cities for decades. 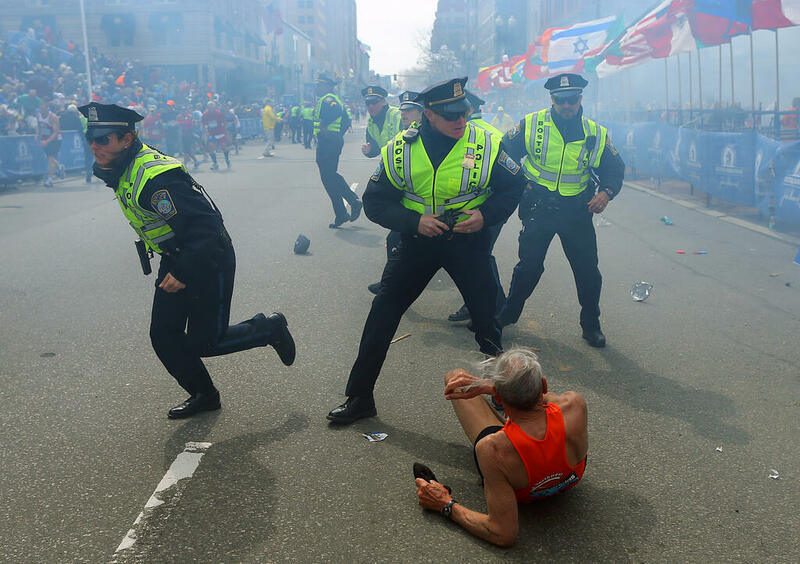 The Boston Marathon massacre is a broad-daylight, caught on video representation of what goes on in 3,000+ wombs each day of the year in our murderous society. The Church of the Lord Jesus Christ in America is complicit in so far as we have capitulated to the prevailing winds of culture, forming ourselves into the image of a circus train, rolling into town with entertainment rather than Gospel power. We have given the country away to the secular humanist church, and they have gladly reformed it into their own image. The media will tell us how to feel and react to this tragedy, as they do each time. The hypnosis has already begun, no doubt, and they will successfully ensnare the majority of us into a safe groupthink before long. This should be resisted, and political solutions which include surrendering our liberties must be rejected out of hand. Pray for our nation. Pray for our leaders. We are in a much worse situation than we can see. With more to say, I’ll quit. What a tiring, yet beautiful age to be a part of. I am grateful to be alive. This morning I have been listening to the January 29, 2013 podcast of Issues, Etc. from Lutheran Public Radio. On this program, Scott Klusendorf shared his insight into Williams’ salon.com article, cutting down her rhetoric to expose the naked, post-modern power-play just beneath the surface. [Williams] is essentially saying there is one class of human beings that you can set aside and kill, and there’s another class you can’t. [We have] a marvelous opportunity to step up and say . . . Listen, I believe that each and every human being has an equal right to life regardless of that human beings size, gender, race, level of development, or degree of dependency. I believe that each and every human being has an equal right to life. [Williams] denies that central premise. She believes that only some humans have a right to life based on some accidental and fleeting thing that may come or go in the course of your lifetime, such as your dependency needs. Which view, the pro-life view or the alleged “pro-choice” view does the better job of explaining human equality? Lincoln argued that any way you argued for enslaving the black man will work equally well to enslave many whites, and you say man A is white, man B is dark, the white skin having the right to enslave the dark skin man, well take care because by that rule you’re a slave to the first person you meet who has skin fairer than your own. It comes down to this: [Williams] says a fetus doesn’t have a right to life; therefore a fetus doesn’t have a right to life. This is power politics; this isn’t any kind of rational argument… if there is indeed a class of human beings that can be set aside to be killed because they don’t meet her standard, you can’t just isolate out one victim class, namely the unborn, and say that doesn’t apply to anybody else. If living independent is what gives us value, then those that depend on any kind of medical device forfeit their right to life, as do conjoined twins. There is no rational argument for why this applies only to the unborn, and not to anyone else. We’ve really come this far. Don’t compromise with this type of monstrous worldview, my friends, but pray for our enemies. Abortion Advocate: So What if it Ends a Life? Her article: So what if abortion ends life? This should come as no surprise. For decades the abortion rights crowd has been struggling in vain to argue that a child in utero is not a human life, tacitly admitting the immoral nature of, well, killing kids. The debate has centered on where and when life begins – pro-life advocates arguing correctly that it begins at conception, and pro-death advocates arguing it begins… some other time. The debate has been an argument in semantics. The pro-death crowd has known all along that abortion is murder, but it would not have been very convenient politically to go around mere decades after the holocaust openly arguing that some people are less worthy of life than others, and may be legally murdered by those who are stronger. Well, no longer is such a deception quite necessary. It seems that in the midst of our rapidly declining culture, the unbreakable focus on self-pleasure has opened the way for some brutal honesty in the pro-death crowd. Our collective idol is surely the glorification of the self, and so as events and people threaten the promotion and happiness of self, any means necessary becomes permissible in continuing on the path of -ME FIRST-. We see this on a national scale – for at least 70 years, we have been willing to send our military into other peoples’ countries if there is a threat to our economic interests. The CIA has busily toppled one harmless government after another (killing off countless civilians) in pursuit of more favorable business conditions for our major corporations. We invade, bomb, break, and steal in pursuit of happiness. In the past 10 years, we have reached the new heights of openly practicing torture on non-combatants, keeping people in prison camps who have not been charged with any crime or been found taking up arms against our country. We are viciously committed to our way of life, willing to kill anyone who blocks our path to personal Valhalla. We smash the people and things that stop us from pleasuring ourselves. Kids are a gift in the ways we need them most. They teach us infinitely more about self-sacrifice and self-giving than anything else can. They become our greatest contribution to the world as we train them up and teach them the ways of righteousness, ingenuity, and selfless love for others. But they do put a crimp in our style. They whine, they cry, they disobey. They have bedtimes that keep us from going out and drinking ourselves into the latest STDs, and they demand more of us than we feel we have to give. They oftentimes take us down a notch or two on the financial ladder of life. That’s really the final straw for many Americans. We smash the people that stop us from pleasuring ourselves. Did we really think abortion was about something else? I know that there are many different, nuanced reasons that women get abortions, but underneath each of those reasons is a lie. She is hearing a lie that she is believing, and the victim will be her own daughter or son. Counting all the “surgical” abortions and birth control pill abortions over the past 50 years, America and the West have hundreds of millions of murdered children on our hands. That’s a lot of happiness being pursued, I guess. And how are we doing on that happiness thing? We’re the most heavily medicated nation on earth, by far. We live and function on antidepressants and anti-anxiety meds. We’re miserable in so many ways. Oops – maybe we didn’t kill enough of us? I wonder how long it will take for our nation, our culture to realize the pursuit of happiness is on a self-forgetting path, and it runs like a dagger right through the beating heart of self-centeredness. Until we get that, we’re the puppets of tyrants, we’re the puppets of devils, and we’re the puppets of these evil hearts within us.